Management Systems Society’s Acquisition of a Majority Stake in MedTech Media, LLC - Berkery, Noyes & Co., LLC. Berkery, Noyes & Co. LLC, a leading independent investment bank serving the media, information, and marketing services markets, assisted in negotiations and acted as exclusive financial advisor to MedTech Media, LLC’s founder and selling shareholder Neil Rouda in his sale to the Healthcare Information and Management System Society (HIMSS). “Two of the healthcare technology industry’s top information and communications providers have deepened their relationship to further serve this robust marketplace.” said Kathleen Y. Thomas, the Managing Director at Berkery Noyes who represented Mr. Rouda in the transaction. As MedTech’s partner since it was founded in 2003, HIMSS has a deep understanding of its new subsidiary’s values and interests. As part of the deal, MedTech will begin publishing Government Health IT in 2011. 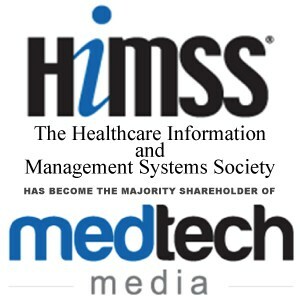 Editorial decisions of MedTech’s award-winning publications, Healthcare IT News and Healthcare Finance News, will remain independent and MedTech will continue to produce HIMSS Daily Insider, the HIMSS Expo Yellow Pages, the HIMSS Resource Guide and other annual conference-related publications and products. “HIMSS” interest in our company reflects well on the talents and dedication of the people who work at MedTech. We owe our success to our partnership with HIMSS, to the industry we cover, but most of all, to our hardworking employees,” Mr. Rouda said. MedTech’s management team, led by current President, Jack Beaudoin, will maintain significant ownership in the company. “Going forward, it is my expectation that the activities of HIMSS and MedTech, while continuing to be run through separate companies, will support mutual growth and our ability to drive improvement and transformation in healthcare through information technology,” said HIMMS president and CEO, H. Stephen Lieber, CAE. About Berkery, Noyes & Co.
Berkery Noyes provides strategic mergers and acquisitions transaction advisory services, financial consulting, and strategic research to information, media, marketing and technology companies. Kathleen Thomas leads the firm’s Media, Information, and Marketing Services practice. MedTech Media is an independent publishing company, headquartered in New Gloucester, Maine. The fully-integrated media company is committed to serving the healthcare IT and finance markets by providing news through print and digital information delivery systems. Its industry-leading brands Healthcare IT News, Healthcare Finance News, and Government Health IT. Each brand includes a breadth of products, including Web sites and online publications, lead generation programs, custom publishing, virtual and face-to-face events, as well as integrated media programs in order to give advertisers the best ROI. HIMSS is a cause-based, not-for-profit organization exclusively focused on providing global leadership for the optimal use of information technology (IT) and management systems for the betterment of healthcare. Founded 50 years ago, HIMSS and its related organizations have offices in Chicago, Washington, DC, Brussels, Singapore, Leipzig, and other locations across the United States. HIMSS frames and leads healthcare practices and public policy through its content expertise, professional development, and research . Please fill out these additional fields and submit again. All fields are required. An independent investment bank focused on mergers and acquisitions advisory, debt and equity financing, and valuation services for a wide range of companies throughout the information industry. Securities services offered through Berkery Noyes Securities, LLC Member of and . 2019 Copyright Berkery, Noyes & Co., LLC..